LAST CHANCE TO BECOME 9to5!!! Our new members casting evening takes places tonight for this fantastic new show. If you are interested in auditioning to be a part of it then you must email 9to5@lyricclub.net for full information on the evening. If you have already registered your interest but not received an email about the evening then please contact us now. The club are delighted to announce that John McGlone shall be returning to take on the lead role of Bobby Child. Click here for full casting. Our Follies girls have all been named. Click here for more info. Some previously uncast parts have now been announced. Click here for more info. With our 2014/15 season now well underway, it seems appropriate to launch our charity. This year we will be supporting Pancreatic Cancer Action who will benefit from our production in the spring but also benefit from various activities throughout the season. Click here to find out more about the work they do. The Committee & Production Team are delighted to announce the casting for our upcoming 2015 show of Crazy for You. Please click here to see the full cast breakdown. There is still time to audition so please contact Islay should you be interested. 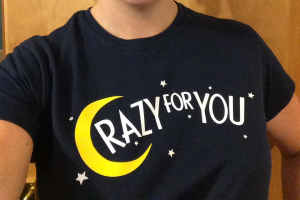 Crazy For You Merchandise – AVAILABLE NOW! Why not add to your collection? Speak to any member of Lyric Club committee to purchase some of the amazing Lyric Club Merchandise. With T-shirts, Hoodies, Bags and Mugs all now available. http://lyricclub.net/wp-content/uploads/2017/06/new-logo.png 0 0 admin http://lyricclub.net/wp-content/uploads/2017/06/new-logo.png admin2014-10-08 14:42:142014-10-08 14:43:07Crazy For You Merchandise - AVAILABLE NOW! Crazy For You LAUNCH NIGHT! A warm welcome to all our new members and welcome back to our present members! We are looking forward to welcoming you all at our first ‘Crazy for You’ rehearsal on Monday October 6th. This will take place at 7.30pm at the Minerva Club Rooms, 59 Burnbank Terrace, Glasgow G20 6UQ. At the moment we are still looking for new members (especially men). If you know anyone who is interested in joining us please ask them to contact Andrew Jack at secretary@lyricclub.net. http://lyricclub.net/wp-content/uploads/2017/06/new-logo.png 0 0 Webmaster http://lyricclub.net/wp-content/uploads/2017/06/new-logo.png Webmaster2014-09-17 11:44:182014-09-17 11:45:21Crazy For You LAUNCH NIGHT!